One of my readers recently asked whether the cougar (Puma concolor) might be the same species as the extinct North American cheetahs (Miracynonyx inexpectatus and M. trumani). This is not as ridiculous a question as a layman might think because paleontologists often mistakenly identify multiple species from fossil remains that after re-evaluation are eventually determined to be from 1 species. I love reading articles about vertebrate paleontology, but I usually skip over anatomical descriptions because they are pretty dry. But to answer his question, I used google to search for a paper comparing the anatomical differences between Puma and Miracynonyx. I did not find a journal article with a comprehensive anatomical comparison between the 2, but I did recall a paper I’d already read that discussed some of the differences. I’ve linked the paper below in my references. Cougars and North American cheetahs had different-sized teeth. Cougars have larger canines and lower molars than North American cheetahs, but they have smaller lower premolars (p4) and smaller upper pre-molars (P3). They also have a “less reduced protocone on upper premolar P4.” North American cheetahs had longer limbs than cougars as the below photos from the linked paper show. So the answer is no. Cougars were definitely not the same species as the North American cheetahs. Comparison of limb bones between cougar and North American cheetah shows the latter had longer hind foot bones and were better runners. North American cheetahs had longer front foot bones as well. Cougars and North Americans cheetahs are closely related, however. Genetic evidence suggests their shared lineage originated 6-8 million years ago, and a puma-like cat, probably Puma pardoides, crossed the Bering Land Bridge from Asia shortly after this. In North America the puma-like ancestor diverged into 3 lines: cougars, North American cheetahs, and jaguarundis. The Puma genus diverged from Miracynonyx about 3.2 million years ago. The fossil evidence shows M. inexpectatus lived all across North America from the late Pliocene to the middle Pleistocene (~3 million years BP-~300,000 years BP). In the Florida Museum of Natural History there are 47 records in state of M. inexpectatus at sites thought to date from the Pliocene to the mid-Pleistocene, but they are known from just 1 late Pleistocene site in Florida. This site is named Lecanto 2A. 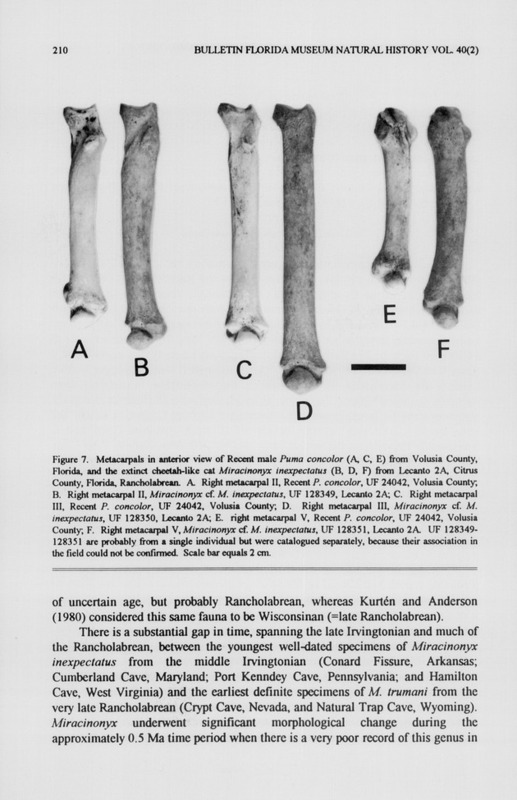 The only other Late Pleistocene site with a possible M. inexpecatus fossil (1 leg bone) is in Cavetown, Maryland. These specimens can’t be radio-carbon dated. 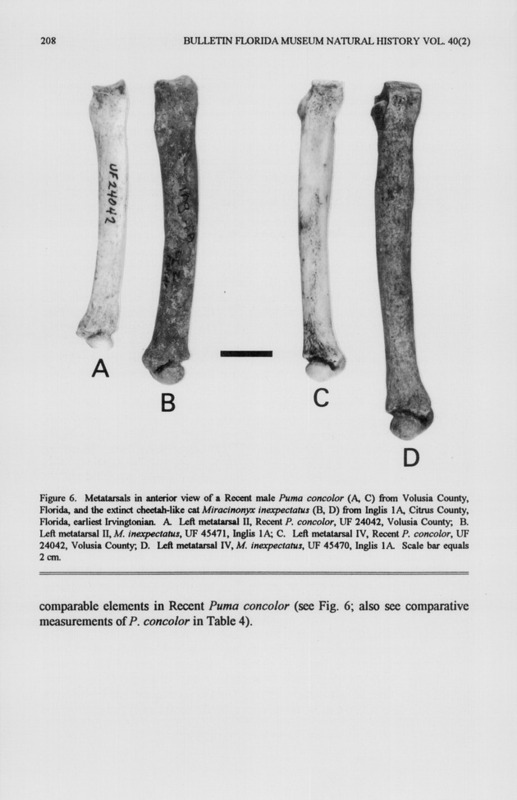 The reason the specimen from Lecanto 2A is considered Late Pleistocene is its association with specimens of other species known from this age including dire wolf, Florida spectacled bear, rice rat, and cotton rat. It’s possible there were relic populations of M. inexpectatus still living during the Late Pleistocene, but it seems more likely it’s a case of older fossils getting mixed with younger fossils. 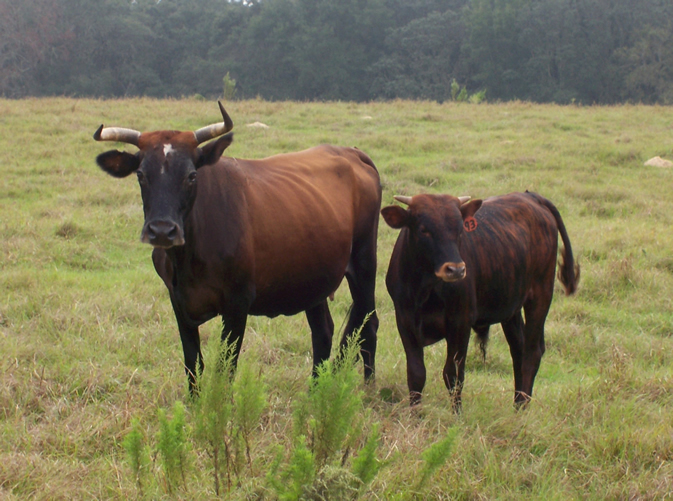 M. inexpectatus expanded its range at a time coinciding with the expansion of grassland habitat. Its long legs helped it run down prey. 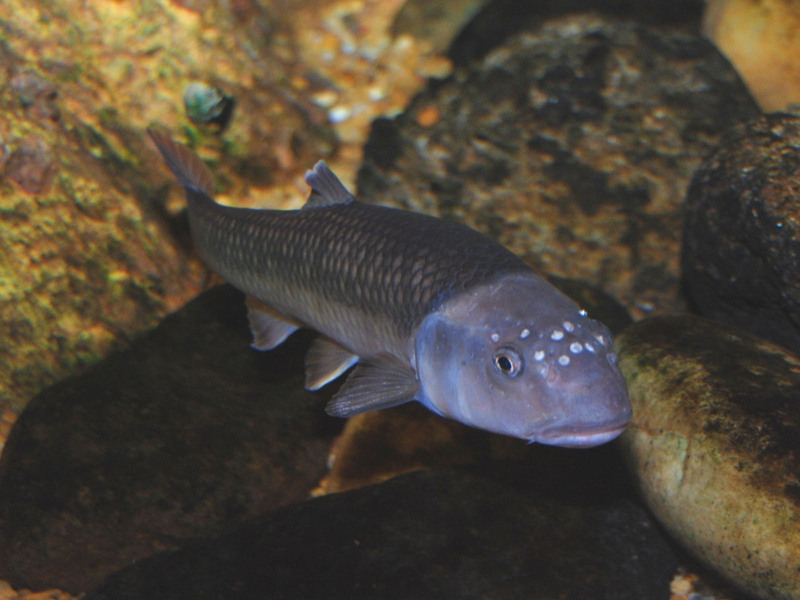 M. trumani was even more adapted for living in open habitat. This species appeared during the Late Pleistocene and was restricted to western North America as far as we know from the fossil record. M. trumani is probably a descendent of M. inexpecatus which had intermediate characteristics between cougars and M. trumani. The paleobiology database indicates cougar fossils dating to the Early and Mid Pleistocene in California, Idaho, Washington, and Mexico have been reported. Nevertheless, cougar fossils predating the Late Pleistocene are rare. In the Florida Museum of Natural History there are 44 records of cougar from the Late Pleistocene but just 2 from the Mid Pleistocene and 2 from the Early Pleistocene. The early Pleistocene specimens are referred to as Puma lacrustis, but I searched for this scientific name on google and found nothing, so I’m not sure what these specimens actually were. Genetic evidence suggests cougars were well established in South America between 300,000 years BP-200,000 years BP, and this corresponds with the widespread fossil evidence of this species throughout North America during this time period. I hypothesize cougars began to expand their range widely during an early Rancholabrean interglacial from a regional ancestral population undetected in the fossil record. This time period would correspond to when forested conditions expanded. Cougars are ambush predators that prefer forests and woodlands. North American cheetahs are not as closely related to Old World cheetahs as previously thought. Physical similarities between the 2 are just another example of convergent evolution. 3 stories relating to the late Pleistocene recently made the mainstream news. The first story is about the upcoming resurrection of the woolly mammoth (Mammuthus primigenius). George Church of Harvard University is using CRISPR technology to genetically engineer a woolly mammoth by editing Asian elephant (Elephas maximus) DNA. (I explained CRISPR technology in a previous blog entry. See: https://markgelbart.wordpress.com/2016/07/22/possible-resurrection-of-the-mammoth-as-early-as-2018/ ) Scientists at Church’s lab are going to edit in the phenotypical characteristics that make the woolly mammoth able to survive in cold wet climates with extremely short and long days. These characteristics include a layer of fat, long oily hair, small ears, the ability to withstand cold temperatures, and adjustments to the circadian rhythms animals that live in the Arctic require. They think they can produce a genetically engineered woolly mammoth by 2019. Scientists hope to eventually engineer herds of woolly mammoths that can live in Siberia where their activities will convert the tundra landscape into a grassy steppe. Ecologists believe a grassy steppe environment will better prevent permafrost from melting, thus mitigating anthropogenic global warming. I’m all in favor of resurrecting herds of woolly mammoths, but I believe their goal of mitigating global warming is a pipe dream, and I doubt woolly mammoths could survive in the present day tundra. I suspect woolly mammoths were confined to relic steppe habitat during interglacials. Climate is a much greater influence on sub-Arctic habitat than the activities of megafauna. Woolly mammoths could probably survive today on the grassy Tibetan steppes but not in the Siberian tundra. The mammoth steppe of the late Pleistocene was more like the modern Tibetan highlands than the Siberian tundra. The 2nd story reported the results of a statistical study that determined the average size of mammal species has declined over the past 130,000 years, and the authors of this study squarely blame man. Humans have been overhunting large mammals that reproduce slowly to extinction, leaving smaller species that can better replenish their populations with faster breeding. Rabbits breed faster than mammoths and elephants. The average size of a North American mammal species during the late Pleistocene was 216 pounds compared with the average North American mammal species of today which weighs 16 pounds. This decline in body size is unprecedented over the past 65 million years and hasn’t occurred since the extinction of the dinosaurs. The fossil record is pronounced…this statistical study just confirms the obvious. Evidence humans may or may not have tracked a ground sloth in New Mexico is perhaps the most interesting story. 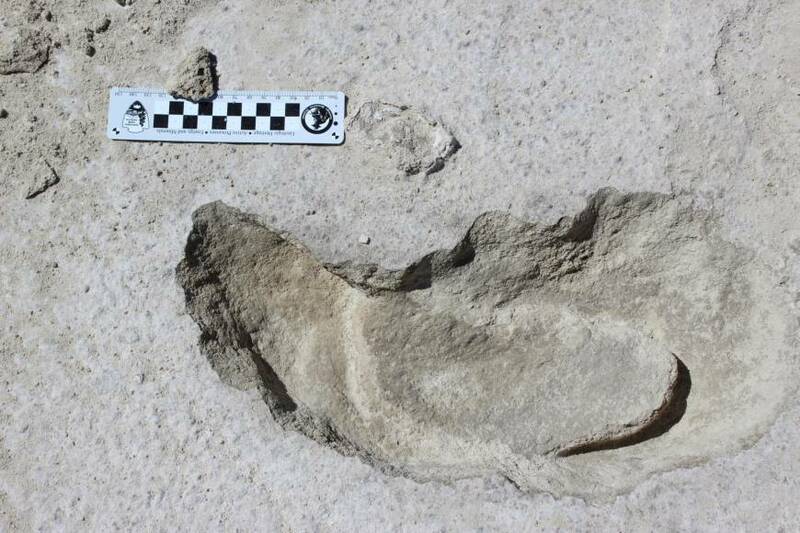 There are thousands of late Pleistocene-aged animal tracks in the White Sands National Monument. During the Ice Age weather patterns were different due to altered climate cycles, and southwestern North America was much wetter than it is today. The site of these tracks, presently a desert, was a lake shore then. The animals walked on the edge of the lake in the mud and the tracks have been preserved for thousands of years. Scientists found human tracks adjacent and actually within ground sloth tracks. Ground sloths usually walked in a straight line, but these tracks appear to show the ground sloth zig-zag, as if it was avoiding a predator. There are 2 sets of human tracks. One human was directly following the ground sloth–his steps are inside the ground sloth steps; the other human was walking very gently beside the other person, as if on tiptoe. The ground sloth circled around and appeared to rise up on its legs and bare its claws. There are claw marks in the ground too. Scientists suggest 1 human was distracting the ground sloth, while the other was sneaking up on it to deliver a fatal spear thrust or blow to the head with a club. The end result is not recorded in the tracks. Other scientists are skeptical of this interpretation. Some think it unlikely humans would hunt the sloth in such an open landscape. However, this site was not as open then as it is today, and humans could easily outpace a ground sloth. Human footprint inside sloth print. The sloth print is 22 inches long. The human footprint is 5 inches. The sloth had a wider stride, so the human must have been hopping to get his foot inside the sloth’s print. I wish there were more mainstream news stories about the late Pleistocene. It’s much more interesting than waiting for Donald Trump to get impeached. You are currently browsing the GeorgiaBeforePeople blog archives for May, 2018.